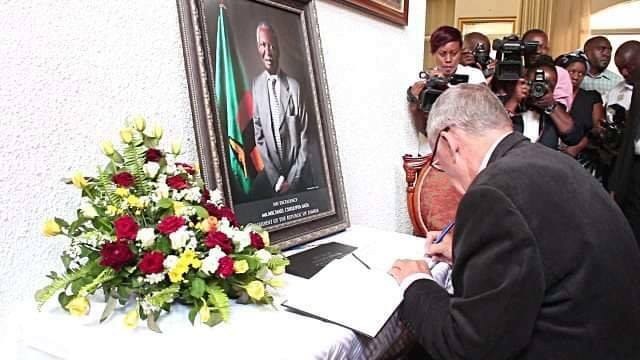 LATE President Michael Sata’s death certificate is available to the public at 9.25 British Pounds, former republican vice-president Dr Guy Scott has revealed. On Wednesday government spokesperson Dora Siliya said government had instituted investigations to establish how Dr Scott obtained Sata’s death certificate and subsequently publish it in his new book titled Adventures of Zambian Politics -Black and White. On page 231, Dr Scott indicates that “since he died in London, his death certificate became publicly available. So when I was non the wiser some months after his death I obtained a copy for the princely sum of 9.25 pounds. And especially for readers in Zambia I include it (see p.232). Carcinoma is cancer; the rest is detail that those of us who are not medics can google. I have no comment other than to say those who had knowledge of his condition could and should have made some very different decisions”. And a United Kingdom based Zambian Journalists has accused government of trying to persecute Dr Scott for fear of ‘opening the Pandora’s Box’ over the schemes that occurred during the successive wrangles when the late president was ailing. During a media briefing Siliya indicated that government was studying the matter and that the nation would be advised in due course. Siliya says “government has taken interest in the matter and wants to know how late president Sata’s death certificate found itself in Dr Scott’s possession”. And a UK based Zambian journalist who opted to remain anonymous, suggests that many Zambians probably did not access the death certificate because they may not have had the knowledge that such a document was easily accessible in the UK. “It appears the family was shielding Sata away from his friends during his illness and as such announcing his cause of death, which was kept under wraps, puts the family in an awkward position. And when we talk of the family I think it’s these same ones that served in senior government positions and were involved in the cat and mouse fights with Sata’s long term friends,” says the source. In his narrative, Scott points out that Sata’s handlers, who were being masterminded by some of his relatives occupying senior government positions, begun to plan on who was going to be the latter’s successor, but were in a quagmire because they wanted him (Scott) out of their way for the presidency. “It became increasingly obvious to me even without information and with my optimistic temperament that Michael was in trouble, and with him, the rest of us. A few days after his scrap with me in his bedroom he arrived somewhat unexpectedly for a meeting at State House. His face was somehow discoloured around his mouth and his walk was a mixture of stugger and slide. We stirred at him as if he was a stranger, worse still he stared at us in the same way,” Dr Scott says, before adding “Michael turned directly to me and told me he was going to fire me before he even sat down and he would appoint Emmanuel Chenda in my position. The casual tourist may not at first notice the danger that was casting its Shadow. There was an immediate rukus with the announcement, disturbing greatly the people who had been anticipating Michael’s demise,” he said. He further outlines that the fear came from the constitutional clause that Chiluba changed in 1996 to bar Dr Kaunda and similarly made Scott ineligible to stand in the event of Sata’s death, pointing out that there was panic if Chenda was appointed vice president to replace the former because he would automatically be the successor. “It would have been quite likely that the advantage of this position, and Michael’s apparent blessings, would allow him to assume the PF leadership and likely become the next president. Whatever manoeuvres were already in place at an advanced stage, I am now sure-to determine the succession of Edgar Lungu would have been dealt a serious blow if Michael had gone through with his announcement,” Scott narrates. “I am sure Michael knew that and was perhaps playing around with people who had been bullying him and lying to him about champagne bottles. But he didn’t act; he told me to stay in my seat. Michael left shortly afterwards, Emmanuel and I went for coffee together, sharing our sadness for our struggling boss”. The source also buttressed Scott’s opinion saying “Chenda was considered a member of the Cartel, they couldn’t have him as vice-president as was most likely going to take over as president after Sata’s death. There were a lot of lies being peddled by the succession camp against their colleagues to the effect that they were enjoying drinking champagne in anticipation of Sata’s death and the first casualty of these was Wynter. They Fabricated some email correspondence in which there was talk of succession, purporting that it came from him,” he says. Scott also outlines this saying “in a confused moment, it is said that Michael phoned Wynter (whom he had already fired), who had immediately rusticated himself to his game and cattle farm an hour’s drive from Lusaka. “Where are you?” Why haven’t you reported for work?” he asked. He claims this proves that Sata was not in a right frame of mind to fire Wynter on his own account but that there was external influence, claiming that, “I myself received many threatening messages from within Zambia, and indeed from the leader of a neighbouring country.” Scott doesn’t reveal who this leader was citing the State Security Act. Scott also outlines that when Sata gave instructions for the creation of the PF constitution he had a deep annoyance over the ‘dribbling’ he endured in 2001 and he ensured a broad based succession requirement was incorporated. He says the clause ensured that there was to be more executive decision as to who should come next and that a general conference of the party (equivalent to the national convention) would be the only body that could legitimately select the successor to a dead or incompetent president. “It should be simple but ambition in the realm of government knows no bounds it seems. Following Sata’s death in October 2014, the acting president (i.e..me) tried to insist that a general conference should pick the successor but it seems that a clique in the party much smaller than the general conference had already decided who was to be president of the PF, thus automatically, presidential candidate in the upcoming by election to replace the deceased state president”. Scott goes on to say “There was rampant thuggery and threat of more and a ‘Kangaroo’ election was held in which only the ‘clique’ candidate stood. I did not want to be the first white man to head an independent African country and, at the same time, be failure at keeping peace. I had to give in when the courts would not back me,” he states.